It’s a bird! It’s a plane! It’s… Smaug on a plane? Leave it to director Peter Jackson to release the first full look of the dragon Smaug on the side of a New Zealand airplane just in time for the Los Angeles premiere of The Hobbit: The Desolation of Smaug. 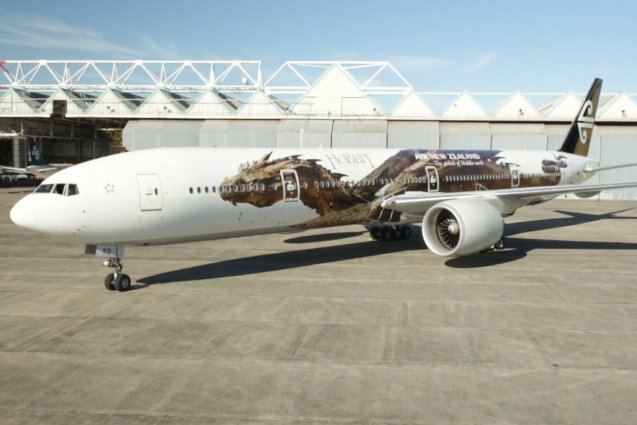 Air New Zealand (the airline of Middle-earth) revealed a life-size image of Smaug (voiced by Benedict Cumberbatch in the film) on the side of a Boeing 777-300 aircraft that is set to land in Los Angeles after taking off from Auckland, reports The Huffington Post via the AP. Up until now, fans had only seen Smaug’s eye paired with Cumberbatch’s gravely voice, but the release of the 54-meter-long (177-foot) picture shows just how epic the dragon actually is. The image is actually a gigantic decal that was created by special effect studio Weta Digital, which is the company that worked on the film. According to Air New Zealand spokesman Andrew Aitken, the airline plans to keep the decal on the plane for at least a year. So just know that when you think you see a dragon flying in the sky, you’re not actually going crazy.